A gorgeous surf video from Rip Curl captures surfing with a multi-camera setup to create the "bullet time" effect popularized by The Matrix, freezing and orbiting the surfers in mid air. Shot in Fiji, the video stars world class surfers Mick Fanning, Owen Wright, Matt Wilkinson, Dillon Perillo and Dean Brady. The setup used 30 HD GoPro video cameras to record continuously, allowing the video to freeze time at just the right moment. Don't miss the behind-the-scenes video below. While The Matrix is usually credited with inventing the effect, the use of a series of cameras to break movement down into many frames was originally developed by Eadweard Muybridge in 1877. He used the strategy to prove that a trotting horse lifts all four hooves off the ground at some point in its stride. In his experiment, a lineup of cameras were triggered by trip wires as the horse went by, and then the still images were reanimated using a device Muybridge invented called a zoopraxiscope. 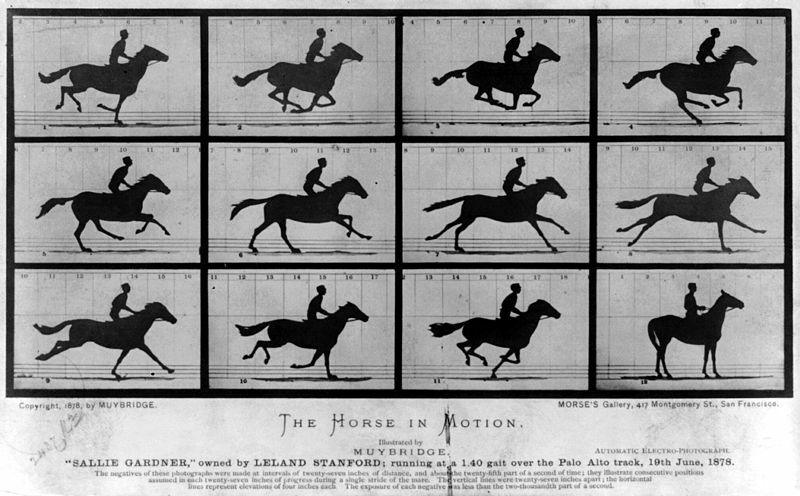 Muybridge's motion study, courtesy of Wikipedia. For more videos by Rip Curl, visit their YouTube channel.